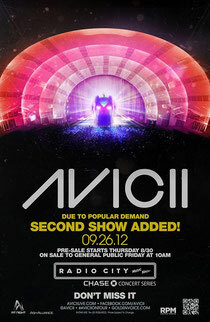 Avicii recently announced a second show at New York’s legendary Radio City Hall. Having sold out the first date in under an hour, the 22-year old Grammy Nominated Swede quickly added another date, September 26th 2012. Just two weeks ago, Avicii and At Night Management together with promoter goliath Goldenvoice and Pacha NYC announced the historic appearance, making Tim Bergling aka Avicii the first ever electronic artist to headline the venue. Now with a second show under his belt, Avicii continues his push forward as one of the most in-demand, electronic acts in the world.